15 Kibabii University students arrested and campus closed following protest – Kenyatta University TV (KUTV). All Rights Reserved. 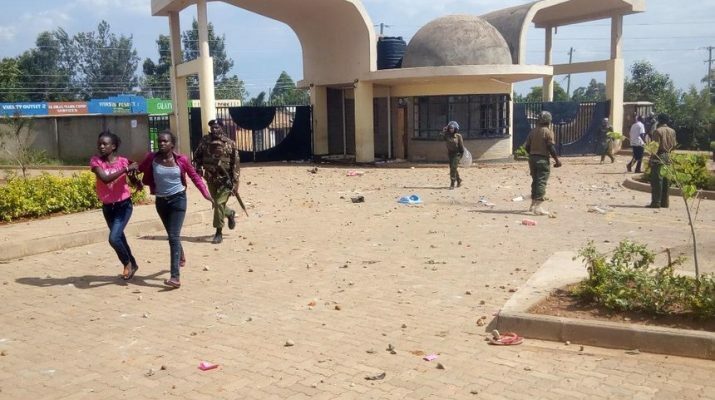 Students of Kibabii University on Monday burnt the campus gate, chased away security guards and lecturers, locked all offices and smashed windows to protest against harassment by management. They barricaded the Bungoma–Chwele road at the Kibabii shopping centre and engaged police officers in running battles. The 3,000 students said the management has ignored their numerous pleas. The students, mostly third-years and fourth-years, said the university has refused to give them their results ahead of the institution’s first graduation ceremony set for November 18. Fifteen students were arrested and the campus closed indefinitely. But vice chancellor Shem Ayua said some of the students’ grievances have been addressed. “The students protested before against lack of adequate seats, which forced them to carry seats from one lecture hall to the other. We have purchased 300 from Kisumu and others are being made here at the school,” he said.